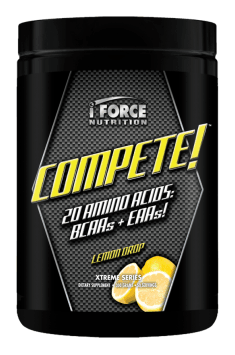 Compete by IForce: Don't Just Excersize,....COMPETE! Why do you work out? Is it to get better at a sport? Is it to get bigger muscles? Is it to lose bodyfat? No matter what your reason is for working out, we all hit the weights and train our bodies for one specific purpose in mind, to compete. It may be a competition with a friend, a competition against a rival sports team, or even a competition with yourself, but no matter what, the goal is to be the best you can possibly be. Stop wasting your time “exercising”, and take it to the next level…Compete! Compete takes intra-workout supplementation to an entirely new level. The days of using antiquated BCAA’s or bloat inducing high carbohydrate/creatine products is long gone. Featuring clinically proven doses of novel amino acids, whey protein hydrolysate, and focus enhancing compounds, Compete is the perfect answer for any athlete looking to get the edge over their competition. When we exercise our body releases very potent chemicals(like adrenaline) that can cause us to go into our natural “fight or flight” mode. Going into this mode protects us from danger in nature, however it can cause athletic performance to suffer significantly. By augmenting our bodies reaction to exercise/physical stress, we can use these powerful chemicals to our benefit, instead of to our detriment. Compete does just that. Through the use of a potent adaptogen (Rhodiola Rosea), Compete will completely change how your body responds to physical stress, allowing you to reap more benefits each and every workout. Adaptogens are compounds that help our body stay more “calm” in stressful situations. An easy comparison would be to look at adaptogens as if they were “coolant” in a cars radiator. Too little coolant and that car overheats, and eventually stops running. The same goes for the human body, we must keep our mental/physical stress within certain limits to enable us to perform at 100% of our best. In addition to including a potent adaptogen, Compete makes sure than not only your body is ready to handle stress, but it also includes a powerful alkaloid from the Perwinkle plant known as “Vinpocetine”. Capable of providing users with enhanced brain blood flow, a mood boost, and more energy, the addition of Vinpocetine was crucial to allowing athletes to feel, think, and perform at their absolute peak. Now while we all know it’s great to feel good when we work out, our actual physical performance is what matters at the end of the day. To increase our overall physical performance, we need to manipulate numerous bodily functions, not just 1 in specific. Compete does this by utilizing clinical doses of the most impressive athletic enhancers currently known to science, two forms of L-Carnitine. L-Carnitine works by forcing fatty acids into our cells mitochondria, where they can then be oxidized and burned for additional energy/power. By doing this, Carnitine will allow your body to create more energy(thus reducing fatigue), burn more fat, and work better/faster at your activity of choice. While other products may use simple L-Carnitine, Compete uses far a more bioavailable & effective form, L-Carnitine Fumarate. L-Carnitine Fumarate: One of the newest forms of L-Carnitine, L-Carnitine Fumarate is the ultimate choice for enhancing athletic performance. This compound is a simple combination of L-Carnitine & Fumaric acid, however its effects are nothing less than incredible. This form of Carnitine gives you all the benefits listed above, however it also brings with it massive improvements on our ATP(think of it like gasoline/fuel for our cells) production. Fumaric acid significantly increases ATP production, so this means each of our cells will be able to produce more energy or “fuel” during your workouts. This means more energy and more performance during your work out and all day long! In addition to simply needing more energy production while we exercise, we also need to protect our muscles (and therefor our physical performance) as workouts can be extremely catabolic(muscle wasting). When we exercise, our body pulls from both our fat and muscle to help fuel our movement. While this is how our body is supposed to work, it is counterproductive for athletes to reach their max potential. To prevent this catabolism, it’s necessary to introduce amino acids into our body while we train. The most effective form of amino acid administration has been shown to be in small amino acid chains, like those found only in Hydrolyzed protein. Compete contains the highest grade Whey Protein Hydrolysate to ensure that you remain anabolic throughout the entirety of your workout. This means more fat being burned, and more muscle being preserved! Compete comes loaded to the gills with clinical doses of yet another form of Carnitine that has been shown to do everything from reduce recovery time(less soreness!) to increase the sensitivity of our androgen receptors (quicker gains)! L-Carnitine L-Tartrate: The most tried and proven form of Carnitine, L-Carnitine L-Tartrate has been making waves in the supplement industry as one of the most effective dietary supplements currently available. Capable of providing instantaneous improvements in your recovery, the massive dosing of this compound will have you not only performing at your best during your workouts, but will have you ready to attack your next workout at 100% intensity without any down time! You’ve heard it before…hydration is one of the most important aspects of performing your best. When we exercise, we sweat, which means we lose massive amounts of water and thus dehydrate ourselves during exercise. While we know it’s important, do you really understand just how important it is? Losing just 20% of our water stores can reduce our athletic performance by up to 50%! So, we know we need to drink more water to stay hydrated, however most of us don’t realize it’s also necessary to add in extra minerals, electrolytes, and phosphates to ensure we stay as hydrated as possible. Compete contains perfect amounts of electrolytes to help your body stay hydrated and keep your engines running at redline. Electrolytes are what allows our brain to communicate with the rest of our body, as they allow conductivity of the electrical signals. Without ample amounts of electrolytes, our muscles can begin to cramp and “give out” due to our brain no longer being able to communicate with them effectively. Compete will help reduce the chance of cramping, and make sure you stay hydrated through even the most intense competitions! Simply put, the ultimate product is here. No hype, no nonsense…just clinical doses of scientifically proven ingredients. Don’t just exercise…Compete! Take one serving (1-2 scoops + 200-300ml of water) 60 minutes before training or during training. Take one serving (1 scoop + 200-300ml of water) between meals or on an empty stomach. It should be sufficient to use during training. In very intense and long sessions, you can optionally use an extra portion before or after training. NUTRITION IFORCE specializes in the production of diet supplements for athletes and people who have an active lifestyle. Their offer includes supplements that increase strength and endurance, as well as products to accelerate building of muscle mass. Brand is also known for the production of creatine, supplements to accelerate the regeneration and helping the weight loss. Natural and artificial flavors, citric acid, silicon dioxide, acesulfame - K, sucralose.